The R-5241XL - which is a bit of a mouthful so I’ll simply refer to it as ‘The Beast’ - is Sirui’s largest and most capable of carbon fibre tripods. It weighs in at 2.8kg without a head attached. To be fair, this is actually quite light for its size. It can reach a full 2 metres above ground (without a centre column as it doesn’t come with one) and can comfortably support up to 30kg. Possibly I shouldn’t be admitting this, but it can actually support my own body weight with ease (admittedly I didn’t have the tripod set to it’s highest setting and had the legs at their narrowest spread, but I still wouldn’t stand on any other tripod base). My Velbon Mark 7G weighs a full 3kg and only reaches 178cm (compared to the Sirui’s 200cm) while supporting 14kg, so the Beast is actually lightweight for it’s size and height. Short it is not though, and folded without a head it still packs to a lengthy 69cm. However, you don’t purchase this tripod if you are concerned about weight. This is a niche product. People who buy it either really need it, or seriously want it. If you have read this far there is a good chance you are in one of these categories. If you are looking for a travel tripod or anything that is going to be easy to lug about, then this isn’t the tripod for you. The Beast exudes quality and workmanship from every angle and surface. I am extremely impressed with the build quality and finish. The leg tubes are constructed from 10x Carbon Fibre while the joints and screws are made from extremely durable forged metal. 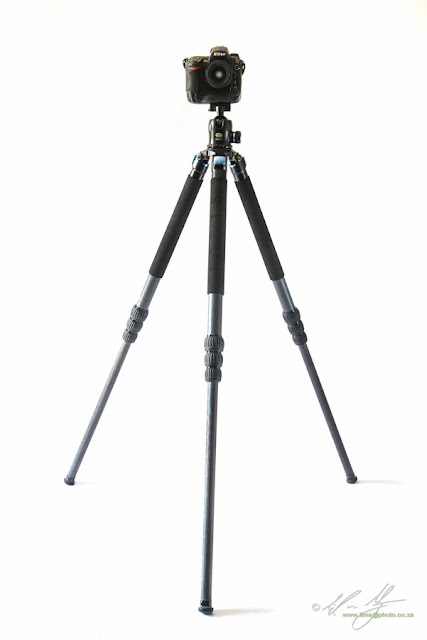 Sirui have been at the leading edge of carbon fibre tripods, utilising 8x carbon weaves in their other tripod offerings. As a point of comparison, Gitzo, arguably one of the benchmark manufacturers in tripod design, use 6x carbon fibre. What this essentially equates to is the number of layers of carbon fibre that were grafted together to form the tube. 6x has 6 layers while 10x obviously has 10 layers. In theory, the more layers you have the stiffer and stronger the material should be. You can also, in theory, make the material lighter and thinner than conventional metals by using very thin layers of carbon fibre with weaves that alternate in different direction. 10 layers is the most I have come across in a tripod so far. Although I don’t have any scientific methodology or tests to fall back on, the beast seems to me to be the sturdiest tripod I have used. Where other carbon fibre tripods somethings feel a bit ‘tinny’, the Beast appears solid. 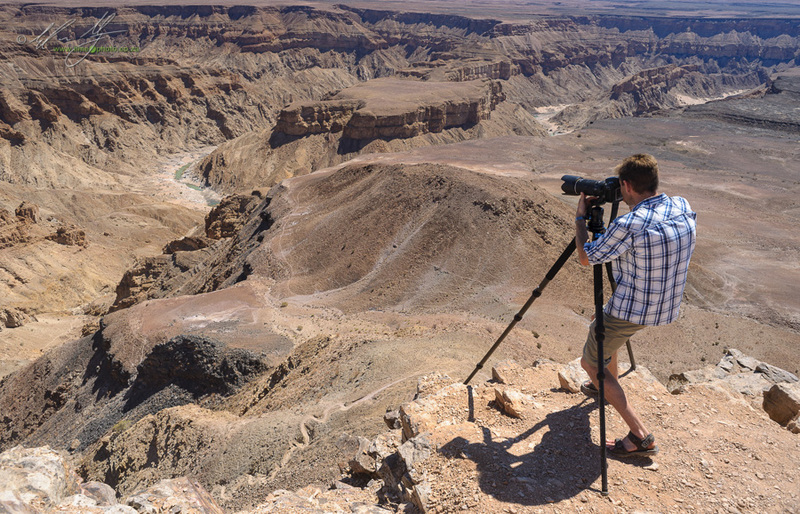 While leading a workshop in Namibia I was able to directly compare a Gitzo Series 3 systematic tripod with the Beast. It wasn’t really a fair comparison as the Gitzo Series 3 systematic is designed as a smaller tripod. More favourable would be the larger series 4 tripod, but I didn’t have one at hand (and have only had the opportunity to see one in the ‘flesh’ before, and didn’t get a chance to actively use it). 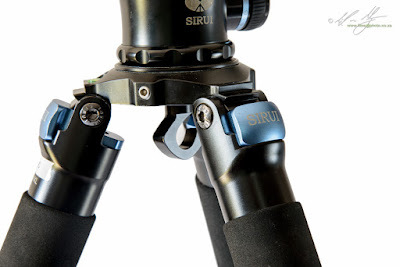 At any rate, the comparison between the two tripods is such that the Sirui feels more substantial and almost indestructible in comparison to the Gitzo. Since there is physically more tripod leg on the Beast, there has to be a lot more metal componentry as well. All of this apart from the leg angle stops has a black anodised finish. I suspect that the legs’ angle stops are solid anodised (coloured blue) aluminium. 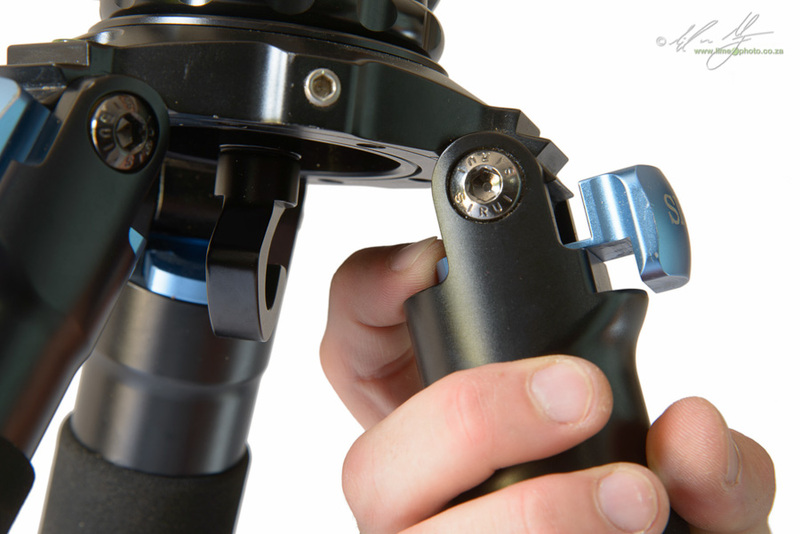 The feet of the tripod are tipped with heavy duty rubber, which can be swapped out for substantial looking stainless steel spikes. The twist leg locks are coated in a very thick ribbed black rubber that is easy to grip and doesn’t slip on the metal collar beneath. A problem I have found in the past with some tripod leg locks that have rubber grips, is that the grip becomes loose and rotates freely around the lock itself when wet, or if under extremely hot conditions. The most obvious features of the Beast should be readily apparent in the specifications of the tripod. to whit: its extreme height ability and impressive weight carrying potential. There are other bits and pieces that make an interesting tripod even more so. First is the fact that this is a ‘systematic’ tripod. What this means is that the base plate can be swapped out for different centre options. I was supplied with a standard flat base plate (with a fitted weight hook underneath) and a half-bowl levelling base. There is also a standard ‘half-bowl’ adapter, which is a preferred mounting option for many videographers, as well as a rapid centre column (the RX-66C). The base plate fits neatly into a large circular section of the tripod shoulder and attaches and locks firmly with three allen-key screws. I shot exclusively with a Sirui K-40x ballhead attached to the Beast. It fits very neatly to the standard flat base, but looks a little small on the supplied the RX-75A levelling base. The reason for this is no doubt to accommodate the larger based video heads that the levelling base is really to be used with. There are 4 sections to the tripod legs themselves. The top tube has a diameter of 40mm with the lowest tube having a 28mm diameter. To put this into perspective, most mid level tripods have a top tube diameter of 28mm! 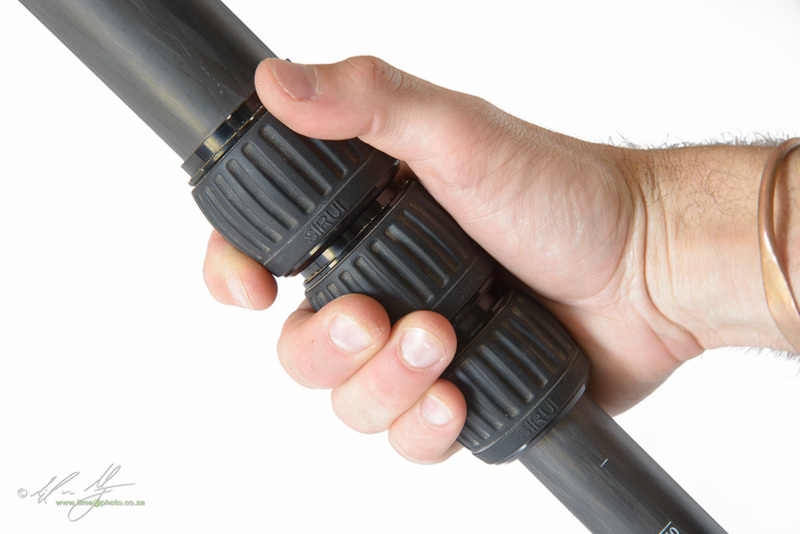 Most pro-level tripods have a top tube diameter of between 30-32mm. The sheer size of this tripod means that it has the potential to be extraordinarily stable. At the end of the legs are the large rubber feet. 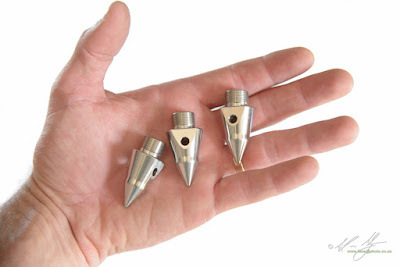 These are exchangeable for sturdy stainless steel spikes that look more like something out of a Van Helsing movie. Unlike some of Sirui’s other tripods where the spike retracts into the rubber foot, you have to choose either the foot or the spike with the Beast. This is easily done by screwing the foot or spike into the bottom of the leg (A relatively fine thread of eight teeth, meaning that the feet can’t accidentally unscrew). Both the rubber feet and the stainless steel spikes feature two small holes drilled into them to act as air holes. This becomes an obvious necessity when you extend the leg tubes; the large suction action created by the large tubes is immediately apparent. Although there aren’t o-rings in the twist locks, as with the waterproof series of tripods, the locks at first do seem to be relatively airtight. This prompted me to pull the foot off, bung the end so that air couldn’t be drawn in through the foot and experiment with extending the legs. There was no real change apart from a more audible whoosh of air coming from the locks. So I guess the holes are there for drainage rather than preventing airlocks. Of course this means that water can get in via the holes in the first place. Still, it had me puzzling over it for a while. One point of the separate spikes is that it can be a nuisance unscrewing the rubber feet for the hard spikes. In my experience, if you don’t have a combined spike/rubber foot, you end up not carrying one or the other, or worse, losing the spikes. I far prefer the screw off rubber foot of FLM CP26-S series which gives you the option of both (unscrew and remove the rubber foot to reveal the sharp spike beneath) but without the problems that sometimes occur with combination feet (jammed with mud or spikes that appear without actually intending them to come out). The legs are able to spread at 3 different angles: 260, 560 and 850 degrees respectively. This allows the Beast to get as low as 100mm from the ground. This isn’t exactly ground level stuff, but it is impressively low for such a large tripod. If I am nitpicking I would have loved a flat setting of 900, but I realise that even with a tripod of this stature you can’t have everything. The actual angle stops are controlled by an aluminium slide lock that slips out from the top of the tripod. It is a sturdier design than the spring designs of Sirui’s smaller tripods, but comes with the limitations of all slide stops. This is the fact that they can get jammed when you pull the leg out to its stop. I found I had to give the leg a tap (make that slap) to jiggle the leg back a bit in order to slide the stop out to the next notch. What is a nice touch though, is the spring reload. When you push the legs back to a narrower spread the stop automatically clicks back to the the smaller angle (unlike other slide angle stops I have used in the past from Gitzo and Velbon). Again, to be fair, the choice of slide angle stops rather than sprung angle stops is probably one of durability. Everything about the Beast screams of durability. It looks, feels and works like a tripod that is designed to survive not only the working life of the camera, but the working life of its operator too. I abuse my equipment. I use my equipment as I would tools, not objects to be molly-coddled. The Beast looks like it would compliment that ethos. Further inline with the rugged nature of the Beast are the neoprene leg warmers. These padded leg covers are supposed to make it easier to handle the tripod in extreme cold or heat (which they do a remarkably good job of incidentally). However, the padding also does a good job of protecting the legs from scuffs, scrapes and acting as a shock absorber when the tripod gets dropped accidentally (which will eventually happen). There are plenty of positives to using carbon fibre in a tripod. The downside, apart from cost, is that carbon fibre can be quite brittle, so is prone to crack if it receives a sharp blow to it. The neoprene leg-warmers just give that added bit of confidence in the Beast’s durability. The heavy-duty nature extends to the oversized and bulky twist leg locks themselves. It’s a full handful of rubber when you hold on to the top most leg lock. The size also means that it is difficult to unlock all the leg-locks at the same time unless you have particularly large hands. Of course, because the tripod is so large most of the the time you won’t have to actually extend all four sections. In fact, operational height is reached with only one or one and a half leg extensions usually. The standard flat base has a very hefty and robust hook that screws on and off. An amazing touch to this is that once unscrewed it reveals an allen key that fits the allen key screws that hold the base in place. It also happens to be the standard allen key size for fixing an Arca-Swiss style tripod release plate to the camera. There aren’t enough fingers and toes in an entire classroom of photography students to count the number of times I have needed this size allen key while on a shoot and found it missing. Adding it to the weight hook on the tripod is a stroke of pure genius! A final touch to the feature set is an easily readable circular level not eh tripod shoulder. There isn’t much to say about it other than it works. As has no doubt already become apparent, this is a large tripod. Some photographers will enjoy working with a tripod of this size while others will literally hate it. To start with, carrying the tripod is an issue. Forget about adding it to the straps on a backpack. It is simply too large and heavy. Although my F-Stop bag can accommodate the tripod (only just), it becomes alarmingly side and top heavy. No, this is a tripod you are forced to carry in your hand if you have to go anywhere with it at all. Then there is the physical size of the Beast along with the very long leg sections. Working in cramped spaces is difficult to say the least. 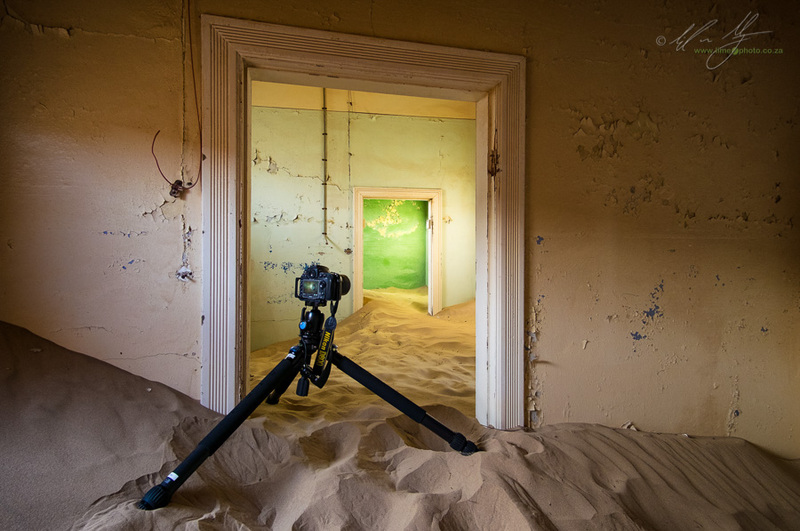 On several occasions while shooting in the Kolmanskop ruins of Namibia I found that the tripod was just a tad too large to get easily into position. Trying to get down low spreads those long legs so wide that it actually becomes difficult to find a floor space big enough to accommodate it. 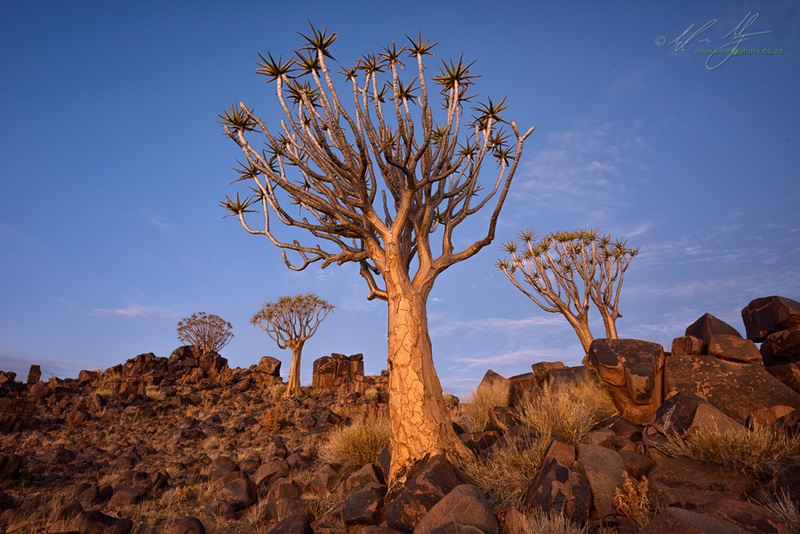 However, shooting amongst the rocks of the Quiver Tree Forest and on the dunes near Sossusvlei and Dead Vlei, the extended height of the Beast was a god-send. Those extraordinarily long legs make finding a secure purchase on uneven terrain an absolute breeze. In situations where I would ordinarily have my tripod precariously teetering on a knife-edge sliver of rock, the Beast’s legs simply extended a little more to a better position. Never before have I been able to get to such precarious camera positions with such rock solid stability. On top of the added stability is that the added height opens up compositional opportunities. Working in Namib Desert’s Dead Vlei, I was able to extend the tripod to it’s full height. The only way I was able to compose and focus was via the live-view on my D800 (I was standing on tip-toes to do so), but it allowed me to play with isolating some of the trees completely against the orangey red dune walls in ways that I have never been able to do in the past. To me this is what good equipment offers: the opportunity to do things that you simply couldn’t do without that equipment. I had the opportunity to test out the height of the tripod again while shooting a video of my daughter and son’s end of year singing show. Not being an official videographer I decided to not setup the gear so that it obstructed all the other parents’ views. Instead I stood, at the back of the small hall and raised the Beast to it’s full height. By doing this and standing on a chair to check composition and focus I was able to shoot over the heads - and indeed outstretched cellphone and tablet wielding arms - of all the parents and get a clean unobstructed view. Apart from the fact that the Beast is big, it is surprisingly easy to setup and strike down. Yes, you need some strength to move it around - it’s not a feather after all - but getting it ready for a shot is a doddle. Part of this is no doubt the fact that extending one section gets you to a reasonable working height. Then there’s the, in my opinion, class-leading stability. Camera shake and vibration are the last things to be concerned about when using the Beast (if you are using a suitable tripod head that is). The only time I had issue with vibration while using the Beast was while shooting the lighthouse at Dias Point near Luderitz in gale force winds. Here, the issue wasn’t really the tripod, or even the head that I was using (a the Sirui K-40x), but the actual tripod mount on the 80-200mm lens that I was using. In fact the wind was so strong that it batted over a heavy aluminium tripod with a D3 and 24-70mm attached while the photographer had his hand on the tripod, causing the lens to break in two when it struck the hard beach sand. Packing away a tripod has become a significant feature of several tripods that have been introduced of late. In particular is the folding design that stores the legs over the head. This means that the packed length doesn’t incorporate the length of the head. Oddly, the Beast eschews this current fad. I’m personally not concerned with the lack of this feature, but why on earth provide a tripod bag that then doesn’t fit the tripod and head. That’s just silly. It means the excellent tripod bag that is provided with the Beast is never used simply because it would mean having to carry your tripod head in a separate bag. A tripod of the Beast’s size and weight lends itself to having it’s own bag, so why on earth make it so small that it only just fits the legs? A strange oversight considering the other thoughtful features of the Beast. Accompanying the Beast and the standard flat base is the RX-75B levelling base. This is a hefty chunk of forged metal with a half bowl design. The idea is that you can level the base of the tripod head with this unit, meaning that level positioning of the tripod legs is not as critical. In theory this is an excellent and a absolute requirement for anyone shooting serious video work. In practice I have also found levelling bases invaluable in landscape and architectural photography and personally use an Acratech levelling base for much of my photography. Using the Sirui levelling base is extremely simple, simply unscrew the generously oversized bottom wing nut shaped shaft to loosen the bowl. The movement is a little notchy as the half-ball is not a smooth sphere, but actually a ribbed design to lessen weight. This isn’t really a concern though as the point is to level the base before shooting, not while looking through the viewfinder composing (or shooting for that matter). Simply enough really. Except for the fatal flaw (in my mind at least). The levelling base has no visible level. Oops. This means there is absolutely no way to visibly check the actual level of the leveling base. Incidentally this is not a sin only attributable to Sirui. I checked against a professional Manfrotto video half bowl levelling base and …. no level. The newer Gitzo and Really Right Stuff half bowl levelling bases seem to have a spirit-level, but the vast majority of units out there don’t seem to have this simple feature. What this essentially means is that setting the half-bowl levelling base is based on complete guesswork. This is not great if you are creating stitched panoramic images or attempting a fluid pan movement in a video shot. Sirui should really offer a simple plate with spirit-level that can sit between the levelling base and the tripod head. Quite frankly it should really be included in the design ala the Acratech levelling base and every other levelling base designed for stills photographers. I have to be honest. I fell in love with the Beast the moment I opened the box and laid eyes on its carbon fibre form. As a landscape photographer I really need stability in a tripod. You don’t have to work with the Beast to get stability as you do with other tripods. It just gives you that stability as a matter of fact. That’s the real selling point of this tripod. It’s an absolute workhorse that is easy to use and dependable. Not once did I have any issues with its operation. Even just holding the tripod one gets the impression that thoughtfulness went into its construction and detail into its finish. I love the fact that the oversized leg-locks work so well. About a quarter of a turn is all that is needed to lock or unlock the leg sections. I truly appreciate the neoprene leg warmers. They make the tripod easier to grip, protect the legs and keep the Beast comfortably rested on my shoulder when I am hauling it for longish distances (like up the side of a dune). I find the chunky rubber feet excellent, so much so that I never even used the spikes in the end. However, as I stated at the beginning of this review, the Sirui R-5241XL - to give the Beast it’s full name is not a tripod for everyone. For a start it isn’t exactly cheap, but then I wouldn’t expect a benchmark tripod to come in at bargain basement prices. Compared to Sirui’s other tripods, which are already good, this is on a whole new level. It’s craftsmanship is superb and it’s stability is more than impressive. As a stills tripod for studio and landscape work I think the Beast is about as good as it gets. As a video tripod there are a few quibbles though. The half-bowl levelling base is far from perfect without the spirit-level. The legs are also traditionally stills photography oriented. Video operators tend to prefer tripods with spreaders and loose shoulder angles so they can pick up and move their tripod and hefty video camera quickly and with a minimum of fuss (pick up the tripod and the legs fold flat immediately, the spreader acting as the leg angle stop when you set it down again). The Beast requires each leg to be folded in individually and with some force. This is something landscape photographers will appreciate, but run and gun videographers will hate. That said, the Beast would be completely at home shooting a video documentary in the mountains. It’s just overkill and painful for shooting a series of talking heads at an event. Then there is the physical size of the Beast. Using it in small spaces is difficult if not impossible at times. I managed in Kolmanskop, but probably would have found it easier working with a slightly smaller, or should I say shorter, tripod. I got the images I wanted, just with a little more maneuvering than if I had been using say the Sirui 3204x or my FLM CP30-L3s. That same size means that the Beast is not easy to transport or carry, but ease of transport isn’t why you buy the Beast. So the Beast is not a tripod for everyone. Neither is it a tripod to replace all other tripods. Chances are, if you buy one, you probably have other tripods that you will continue to use. Then again, a Hasselblad, Phase One, Red Dragon or even a Nikon D8xx camera are not for everyone. They just happen to be the best of what’s out there. You don’t need a Phase One camera to grab some snaps of the kids, your cellphone will probably suffice. The Beast is not a tripod that suffices, it is a tripod excels at what it does; which is to provide dependable, rock solid stability beyond anything that I have had the pleasure to use so far.